Over the past few years there has been a shift in the European pharmaceutical market landscape, with a rise in specialty medicines for diseases with narrow patient populations. Indeed, QuintilesIMS forecasts that, between 2013 and 2018, 94% of list price value growth will be in specialty medicines – with orphan drugs at the forefront of this trend. 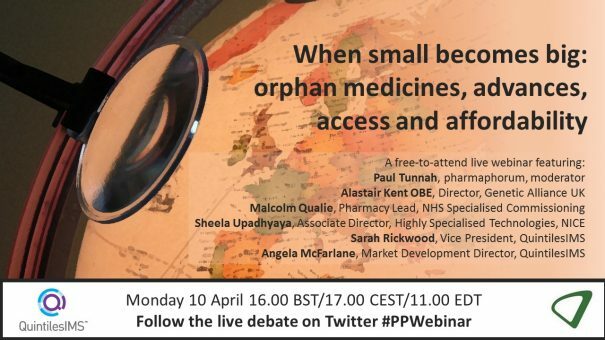 On 10 April 2017, QuintilesIMS, in partnership with pharmaphorum presented a unique digital debate, bringing together a panel of senior industry experts, including participants from NICE, NHS England and Genetic Alliance UK to explore the pillars of commercial success for orphan drugs in Europe in the context of changes in reimbursement processes and broader future challenges, like Brexit. Significant unmet need still remains in the rare disease market, only around 5% of rare diseases currently have an approved drug treatment. This represents a major opportunity for the pharmaceutical industry. Our expert speaker panel assessed the critical factors underpinning success in the rare disease space and provided a view into the future of market access and health technology assessments for orphan medicines – alongside the impact on R&D and clinical trials. With an increasing number of companies committing to orphan diseases, drawn by the accelerated regulatory review process and the prospect of achieving premium pricing compared with non-orphan diseases, it is imperative to understand the criteria for a successful launch and how to fully capture the returns of R&D. Sign up here to view the webinar on demand and hear what the future holds for orphan drugs in Europe in this highly charged political landscape. I came to Genetic Alliance UK over 20 years ago because I was excited by the challenge that new knowledge in genetics created – the idea that, for people affected by a genetic condition, yesterday’s science fiction is tomorrow’s clinical service improvement. Trying to transform these possibilities into positive outcomes whilst reducing the potential for abuse is an incredible challenge, and I feel incredibly privileged to work in this field. The fact that Genetic Alliance UK is now a respected and authoritative voice for patients and families is something about which I feel pride, and also a huge sense of responsibility. It is a challenge that excited me on the first day I became aware of the impact of genetic disorders and which continues to excite me today. Malcolm is the senior pharmacy advisor to NHS England Specialised Commissioning Service. He took up this role in April 2013 when the new commissioning arrangements came in to effect. Malcolm works within the Clinical Effectiveness Team and supports the specialised services clinical reference groups in reviewing the need for clinical commissioning policies. Malcolm is a member of the National Pharmaceutical Supply Group, the national steering group on high-cost medicines, an advisor to the National IVIG Guidelines Group and several NICE committees. Malcolm qualified in 1984 with a BSc in Pharmaceutical Sciences, and gained a Masters in 1987. He worked at several major teaching hospitals before taking up the post of Head of Health Policy and Pharmaceutical Advisor to the East Midland Specialised Commissioning Group in 2008. Sheela Upadhyaya is currently the Associate Director of the Highly Specialised Technology programme at NICE and is responsible for running the programme to evaluate medicines and technologies for rare and ultra-rare conditions for commissioning in the NHS. She has been brokering discussions between industry and the NHS to introduce two managed access agreements which have been developed for two new drugs for rare diseases. Prior to joining NICE, she was responsible for commissioning rare and ultra-orphan disease services in NHS England, where she delivered many improvements to these services by collaborating with industry, clinicians and patient groups. She has led nationally in the NHS for lysosomal storage disorders and delivered more efficient drug and homecare prices by running national tender exercises with the Department of Health, Commercial Medicines Unit. Sheela has a passion for partnership working and believes that collaboration is the key to delivering high-quality results. Mrs Upadhyaya was nominated for a “Compact Award” in recognition of her patient engagement activity and strives to ensure services for patients with rare conditions provide excellent quality and good outcomes in an efficient effective environment. Sarah Rickwood has 20 years’ experience as a consultant to the pharmaceutical industry, having worked in Accenture’s pharmaceutical strategy practice prior to joining QuintilesIMS. She has an extremely wide experience of international pharmaceutical industry issues, having worked most of the world’s leading pharmaceutical companies on issues in the US, Europe, Japan, and leading emerging markets. In her time with QuintilesIMS, Sarah has played a key role in developing the Launch Excellence Thought Leadership and the company’s Launch Excellence thought leadership studies and Launch Readiness offerings which provide QuintilesIMS pharmaceutical clients with comprehensive and critical guidance during the crucial pre-launch and launch periods for their key brands. In this capacity, she has advised companies on the launch of current and potential blockbusters in many therapy areas and countries. Angela works across the UK and Ireland healthcare/life sciences landscape, prioritising environment and policy issues that will impact both client and healthcare systems to 2020. Her reach across the sectors means she is able to readily bring together senior stakeholders from industry, government, patient organisations and health services management to address those challenges collaboratively through the independent and evidence-based solutions from QuintilesIMS. The recent merger of Quintiles with IMS Health enables Angela to offer pharma and healthcare leaders synergistic insights and solutions from clinical research, real world evidence, market insights through to the application of digital solutions. Angela has worked in life sciences for 34 years. In 1998, she was the founding director of HGS Europe, one of the UKs first market access agencies, which IMS Health acquired in 2013 to enhance its local UK and Ireland Market Access capability. Prior to founding HGS, Angela was the Marketing Director for 4 years of a specialist Provider hospital, Surgicare. Angela led Surgicare’s shift from a private patient base to a predominantly NHS case-mix by guaranteeing improved outcomes in low acuity surgery (cataracts, varicose veins, hernias) to the patients of fund-holding GPs and Health Authorities across the North West and West Midlands. Angela spent 9 years in the pharmaceutical industry working for Merck Sharp and Dohme and Bristol-Myers Squibb, where she held both marketing and regional management positions between 1982 and 1991. During that period she launched two angiotensin-converting enzyme inhibitors (ACEIs) and a statin. Angela speaks on the international Market Access circuit and has co-authored a number of IMS Health thought-leader papers on the UK and Irish markets, such as When small becomes big; the new challenges of orphan disease medicines across the EU5.